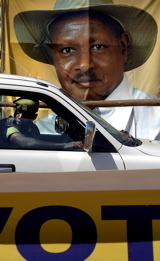 Uganda’s next election may only be in 2016 but President Yoweri Kaguta Museveni, who is almost certain to run again, has set out an early agenda. He is mobilising support amongst the armed forces and veterans – and moving to quash all dissent in the governing National Resistance Movement (NRM). With the Public Order Management Bill, which has been widely criticised for restricting free speech, having passed into law in May, police now have discretionary powers to break up meetings of three people or more that they believe to be political. Museveni may also be seeking to raise the constitutional age limit for a president above 75. The inauguration of Mali's President Ibrahim Boubacar Keïta on 19 September in Bamako was conveniently timed for visiting French President François Hollande. It allowed Hollande to talk up the success of his Mali mission ahead of the United Nations General Assembly session opening on 24 September. Hollande wants the UN's Peacekeeping department to find more troops for its planned 12,600-strong mission to northern Mali. So far, there are just 5,000 UN troops. France is to cut its own troops there from current levels of 3,200 to 1,000 special forces by the year's end and the European Union mission to retrain two batallions of Malian troops has been dragging its feet. After France's military intervention retook control of northern Mali's three giant provinces and a ceasefire agreement allowed a credible election to be held, many believe that Keïta has a chance to rebuild national security. But there are some warning signs, with serious clashes in western Mali near the Mauritanian border between government soldiers and fighters loyal to the Mouvement national pour la libération de l'Azawad (MNLA) last week. That will, at least concentrate minds. Keïta's government has just 60 days from the date of the elections to negotiate a lasting accord with the MNLA and other Tuareg and northern groups. For the first time, the Bamako government has created a Ministry for Reconciliation and Development of the Northern Regions; Keïta appointed Zahabi Ould Sidi Mohamed, a veteran Arab opposition politician to the post. Much harder to achieve will be Keïta's aim to put a definitive end to the northern rebellions that have punctuated Mali's history since Independence in 1960.